South Africa and Mozambique sign MoU in the field of Biodiversity, Conservation and Management, Skukuza, Kruger National Park, 17 April 2014. South Africa and Vietnam strengthen cooperation in field of biodiversity conservation and protection, 24 March 2014. Parliamentary Portfolio Committee on Water and Environmental Affairs’ workshop on rhino poaching, Skukuza, Kruger National Park, 1 - 5 December 2013. South Africa and Vietnam sign a MoU on cooperation in the field of Biodiversity Conservation and Protection, 10 December 2012. Minister Edna Molewa hightlights progress in the fight agaisnst rhino poaching, 21 January 2016. Minister Edna Molewa highlights progress in the fight against rhino poaching, Pretroia, 30 Aguust 2015. 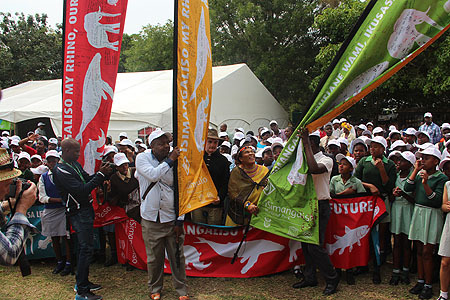 World Rhino Day March, 22 September 2013.